A visit to the Faro de Moncloa observation deck is even more unique now. 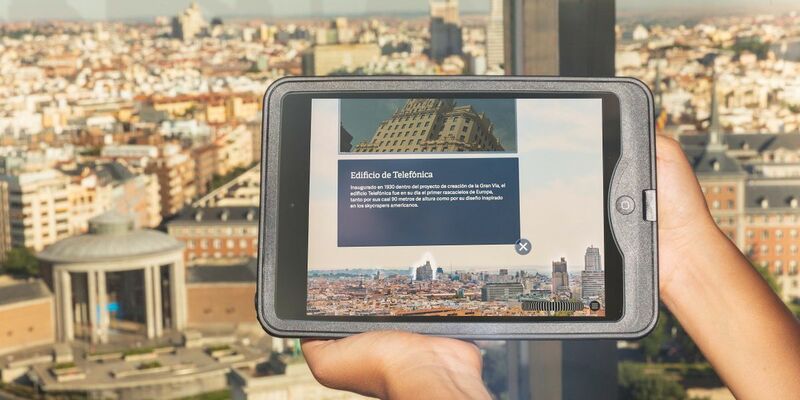 The tower, managed by Madrid City Council's Tourism Department, has just expanded its offerings with Faro Explorer, an innovative new service. The augmented virtual reality tool enables visitors to enjoy the best views of the city at a height of 92 metres, offering spectacular close-ups and relevant information on the capital’s most unique buildings, in addition to other features. With the aid of a tablet, users don't have to move an inch from the Faro’s observation deck to get incredibly close-up views of the capital’s most iconic places, of Casa de Campo Park and of the Guadarrama mountains. It’s a modern-day “telescope” with over 20 magnification settings, which in addition to offering close-up views of the capital’s most important monuments also allows users to read detailed descriptions of them. With Faro Explorer users can also make virtual visits to over ten places, enjoying 360º views with unprecedented clarity, and even enter several buildings to see them on the inside. From the Faro’s observation deck visitors can “walk” through El Capricho Park, Cibeles Palace, the Royal Palace, Matadero Madrid, the National Archaeological Museum, the National Museum of Natural Science, the Trophy Room at Santiago Bernabéu Stadium, the Glass Palace in El Retiro Park, Puente de Segovia bridge, Puente de Perrault bridge, the Basilica of San Francisco el Grande and the Church of San Antonio de los Alemanes. Faro Explorer is also designed to be a tool to improve the sustainability of tourism, offering virtual visits to attractions outside the city centre with the aim of encouraging people to visit them, reducing tourist flows inside the city. Faro Explorer also has a “lift” function that enables users to position themselves 500 metres above the Faro de Moncloa to view Madrid from up high, and they can rise to a height of up to 20 kilometres where they’ll be able to make out the entire Iberian Peninsula and even the sea.